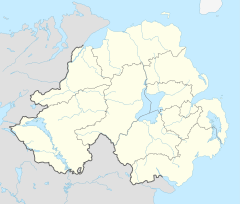 Dungiven (from Irish: Dún Geimhin, meaning "Gevin's fort") is a small town, townland and civil parish in County Londonderry, Northern Ireland. It is on the main A6 Belfast to Derry road. It lies where the rivers Roe, Owenreagh and Owenbeg meet at the foot of the 1,525 ft (465 m) Benbradagh. Nearby is the Glenshane Pass, where the road rises to over 1,000 ft (300 m). It had a population of 2,993 people in the 2001 Census, an increase of 6% over 1991. It is within Causeway Coast and Glens district. Dungiven sprang up around Dungiven Castle and the Church of Ireland (Anglican church) at the eastern end of the town, later spreading westwards along Chapel Road and Main Street towards the bridging point on the River Roe. Because of the River Roe's flood plain and the line of a proposed by-pass, housing development has been mostly to the east and north of the town. It is an important service centre for the surrounding rural hinterland; offering educational, health, commercial, social, community and recreational facilities. An interesting site in Dungiven is the 11th century Augustinian priory of St Mary's and the tomb of O'Cahan (Cooey na Gall O' Cahan), laid to rest in 1385. A thicket of thorn bushes hung with rags conceals a bullaun stone, visited for wart cures. Between the 12th and 17th centuries the area was ruled by the Ó Catháin clan, one of the most influential clans in Ulster and respected throughout Ireland. In the early 17th century they built Dungiven Castle, which - having been substantially rebuilt in the 19th century - remains today as a restaurant and guesthouse. The world-famous song Danny Boy is taken from a melody composed by the Ó Catháin bard, Ruairí Dall Ó Catháin. The original version concerns the passing of the Chief Cooey-na-Gall, whose death brought an end to the long line of O'Cahan chiefs. During The Troubles in Northern Ireland, seven people were killed in or near Dungiven in connection with the conflict, six of whom were members of the security forces. The one civilian, Francis McCloskey, was found beaten to death in disputed circumstances during street riots, in which the police were called to respond. He has sometimes been deemed as the first person killed in the last installment of the Troubles (1969-1997). Dungiven Celtic F.C. is an association football club playing in the Northern Ireland Intermediate League. Gaelic games are the most popular sports in the area. St Canice's Dungiven is the local Gaelic football club; the team plays at O'Cahan Park and have won the Derry Senior Football Championship 7 times, and won the Ulster Senior Football Championship once, in 1997. Kevin Lynch's is the local hurling club; they have won the Derry Senior Hurling Championship a record 22 times and are the current county champions, for the fourth successive year. The team plays at Kevin Lynch Park. 6.7% of people aged 16–74 were unemployed. Dungiven sits on the main A6 road and has good road links to Derry (29 km to the west) and Limavady (13 km to the north). A proposed by-pass for Dungiven, following a route to the south west of the town, has been marked-out since the 1973 Limavady Area Plan. Dungiven was the terminus of the Limavady railway, which closed in 1950. Dungiven railway station opened on 4 July 1883, closed for passenger traffic on 1 January 1933 and closed altogether on 3 July 1950. Dungiven is mentioned in the Brian Friel play Making History, as the place where Mabel Bagnel goes after the Siege of Kinsale. ^ a b c "Dungiven Settlement Designation". Planning Service - Draft Northern Area Plan 2016. Retrieved 25 June 2008. ^ a b "Dungiven profile". Culture Northern Ireland. Archived from the original on 9 June 2008. Retrieved 15 July 2008. ^ Sutton Index of Deaths - 1969, cain.ulst.ac.uk; accessed 5 May 2014. ^ "St Canice's GAC, Dungiven". St Canice's GAC website. Retrieved 18 April 2012. ^ "Dungiven station" (PDF). Railscot–Irish Railways. Retrieved 12 October 2007.